If summers are always too hot and winters are too cold, and if you feel like you can't win, then you should check out the Dodge Challenger's interior features. This popular muscle car has seating features that will keep you cool when the weather gets warm and toasty warm when icy temperatures hit the air. The available ventilated seats offer more than just a sleek and stylish appearance. They'll also keep you from feeling sticky against the seat on days that you're sweating from the hot weather. And you'll also appreciate the available heated seats that are perfect on chilly mornings. 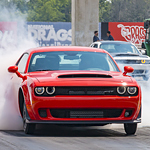 If the Dodge Challenger is sounding super cool and red hot at the same time, come to Ram Country Chrysler Dodge Jeep. Our friendly and knowledgeable sales associates look forward to chatting with you about all of the features on the Dodge Challenger as you go for a test drive.